How did you find the Kantha artisans? What cachet do the words “handmade" and “fair trade" have on the international fashion scene? The knowledge about fair trade is limited in the US, but it’s growing. Sales have been declining in the mainstream market, but sales in fair trade have been growing. Fair trade products are still expensive products. It’s still sort of an elite (purchase). But shopper values are changing. Those words—handmade and fair trade—definitely are a selling point. The whole green craze has taken over, so it’s definitely helped us. Can you describe your look and how you would wear the bag? The hobo bag is a slouchy carry-all, with more of a relaxed bohemian look. The weekender bag is more of a structured look. The weekender bag is great for a post-wedding getaway. It’s a popular wedding gift. Randomly, we’re a hit in Canada. People get really personal about their purchase. They’re so touched by the business model and they feel like they’re doing something amazing by buying it. You have some celebrity fans already, Freida Pinto being one of them . 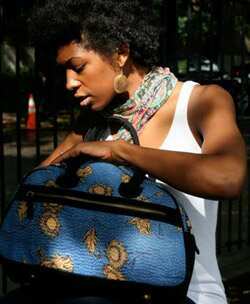 How does the purchase of the bag help the weavers? When you buy a bag, you’re supporting demand for more work. These people are getting paid; it’s a business; and you’re supporting their economy. We don’t take a salary. It’s not to be pious; it’s just the way it is. And we donate a percentage of our profits to programmes that encourage young women to get involved in business and teach them entrepreneurial skills. By nature, women are entrepreneurial, but the environment sometimes doesn’t necessarily let them. 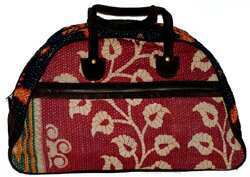 Kantha stitch can be done at home, lending itself to raising children. Have you researched any other Indian fabrics or weaves? Any plans to branch out into them? The idea was to go to different countries and do different textiles. We’re looking at Thailand next. Then, maybe Bolivia and Sudan and Mali. But that’ll take a really, really long time.